To be masculine in character, face of medium length, broad and full between the eyes muzzle strong, nostrils, wide open; strong jaw; ears of medium length, white and alert. Eye, prominent and bright. Face, jaws and top of head covered with strong, bristly hair and free from wool. 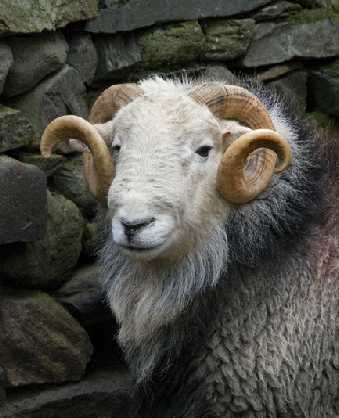 Horns smooth and round, whitish in colour, low set, wide apart and rising well out of the back of the head. To correspond, except that the head should show a distinctly feminine character and be entirely free from any sign of horns. Medium length, rising well out of the top of the shoulder which should be well laid back and deep. Ribs well sprung, well-filled behind the shoulder. Back broad and flat, strong loins. Hind quarters set squarely on good legs of mutton well fleshed to the hock. Breast deep and prominent. Fore legs straight and clean with big knees and springy fetlocks. Hind legs strong, flat boned, straight and well covered with strong, bristly hair free from wool. All four legs set well outside the body, and big white hoofs preferred. Thick, strong and full of muscle. Sheep when turned should have a deep chest and prominent breast bone. Broad across the belly and well covered with wool of a clear and white or blue colour. The hind legs should be straight and lie flat out on the ground. The coat should be heavy and dense with a good undercoat of fine wool of even colour and quality over the whole of the body, with a stronger ruffle or mane round the neck and top of the shoulder. The face and legs should be a clear “hoar-frosted” colour on all sheep. Brown or Yellow colour in any part.